The Geneva Spur, named Eperon des Genevois and has also been called the Saddle Rib is a geological feature on Mount Everest—it is a large rock buttress near the summits of Everest and Lhotse. The Geneva spur is above Camp III and the Yellow Band, but before Camp IV and South Col. It is a spur near the south col. A related formation is the saddle (landform) between the peaks of Mount Everest and Lhotse. The altitude of the spur is between 25,000 and 26,000 feet (7,600 and 7,900 m). The Geneva Spur name comes from the 1952 Swiss Mount Everest Expedition. The spur provides a route to the South Col, and is usually traversed by climbers heading for Lhotse or Everest summits. From the top of Geneva Spur, South Col can be seen, and when looking at it Mount Everest is on the left and Lhotse to the right. 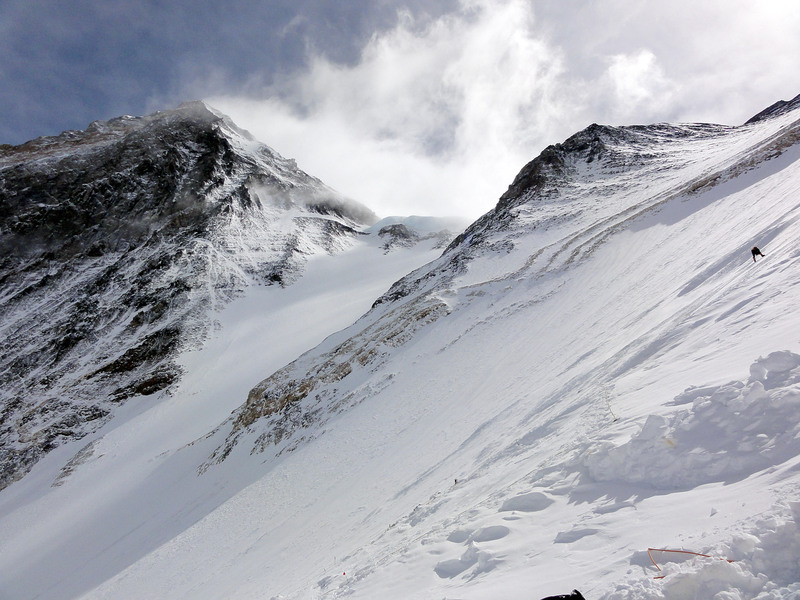 Lhotse climbers typically head southeast from Geneva Spur, and on to a couloir to ascend that summit. On the 1956 Swiss Everest–Lhotse Expedition, the spur was the location of the last high camp before Fritz Luchsinger and Ernst Reiss achieved the first known ascent of Lhotse summit, on May 18, 1956. Far bigger than it looks from a distance, Geneva Spur was a welcome mixture of snow and rock scrambling. The Geneva spur is above the Yellow Band; on the Southeast Ridge climbing route, the Geneva Spur lies above Camp III, but lower than Camp IV (as of 2003) and South Col. The spur provides a route to the South Col, and is usually traversed by climbers heading for Lhotse or Everest summits. The Geneva Spur, [in the 1955 translated edition of a 1952 book] "is now called the Saddle Rib. It is flanked on either side by two steep couloirs, which after fresh falls of snow become dangerously exposed to avalanches, but after dry spells turn to grooves of bare ice". ^ Baron John Hunt Hunt & John Hunt (1993). The Ascent of Everest. p. 132. ISBN 9780898863611. ^ G. O. Dyhrenfurth. To the Third Pole (1955 ed.). Werner Laurie. "Chapter Two [...] Saddle Rib"
^ a b c d e f Grylls, Bear (2004). The Kid Who Climbed Everest. p. 226. ISBN 9781592284931. ^ a b c d e Plimpton, George (2005). As Told at the Explorers Club: More Than Fifty Gripping Tales of Adventure. pp. 155–156. ISBN 9781592286584. ^ "Dave Hahn Achieves His 13th Summit of Mt. Everest". May 24, 2011. Retrieved 2014-04-01. ^ G. O. Dyhrenfurth. To the Third Pole (1955 ed.). Werner Laurie. "Chapter Two [...] Saddle Rib [...]"
This page was last edited on 25 March 2019, at 07:02 (UTC).